This is another optical/extinction meter, very much like my Zeiss Diaphot, and to a less extent my Harrison Light Corrector. The idea is simple: there's a neutral density step wedge inside. You peer through the eyepiece and rotate the dial until the image is just barely visible. 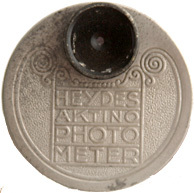 Then you look at the dial (on the back) to read your speed and aperture. They made this thing from the turn of the century until World War II. It was made obsolete by the advent of film speeds, as this takes no account of them. I'm not sure whether I have an early or late model. All the other examples I've seen came in a pressed board box (round to fit the meter). Mine is in a fitted clutch purse.